Shouting from Constricted Lungs, by K.J. Wells, is an important read for poets and those who enjoy reading and studying poetry. Exploring a range of subject matter and emotions, Wells takes the reader on a journey of the heart, profoundly commenting on important topics like war, death, love, and racism. The poet is precise with line length and word choices, and lines of poetry are well-thought out. Strong images in the poet’s work give us artistic beauty as well as contextual significance. Poignantly, Wells is able to use her words to remember those who shouldn’t be forgotten. Among these are family and friends who have shaped her life, especially the poet’s father, Victor Wells. 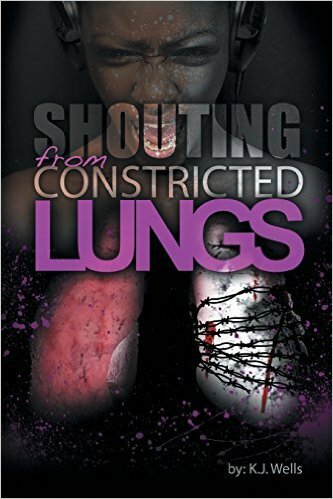 Shouting from Constricted Lungs was published by AuthorHouse Books in May 2014 and is available on Amazon here. Posted on July 27, 2015 by Writer. This entry was posted in Uncategorized. Bookmark the permalink.